Laser scanning confocal microscope offers high-resolution 3D observation and measurement ... in real time. MEMS technology, advanced materials processing, and nano-scale production all require remarkably precise, high resolution microscopic inspection and measurement. 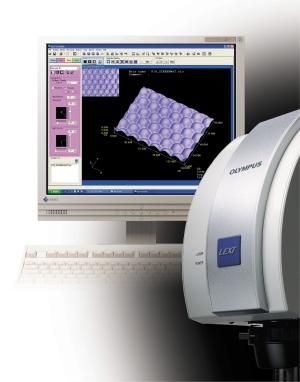 To meet our customers' demands for faster performance, easier operation and greater accuracy, Olympus Micro-Imaging has developed LEXT – a new confocal laser scanning microscope for ultra-precise measurement and observation with the highest levels of reliability. No vacuum pumpdown or sample preparation is required – samples can be placed directly on the confocal microscope stage as they are. Through the Confocal Microscope-LEXT, both 3D observation and high-precision 3D measurement are possible in real time. And because our LEXT confocal microscope uses a laser for pinpoint surface profile measurements, you can achieve unparalleled precision and resolution. With much higher resolution than conventional optical microscopes but just as many different observation methods, LEXT confocal microscopes enable every user to make quicker, more accurate sample analyses, all based on strict traceability systems. LEXT – ideal for next-generation micro fabrication devices like MEMS, for new materials development, and for today's thinner devices, with more compact surface mounting requirements.